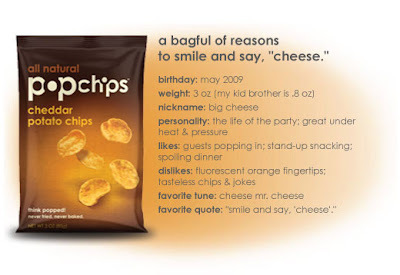 So maybe you know that pop chips are one of my favorite snacks. Big on flavor, low on fat. They're popped instead of fried (too much fat) or baked (not enough flavor and really weird texture) so the taste is phenomenal. Check out my earlier review here. Two new pop stars have been added to the tastey line-up — Sour Cream & Onion and Cheddar. Yum. Pop on on over to Whole Foods, Safeway, Jamba Juice and Target to check them out! Enjoy!